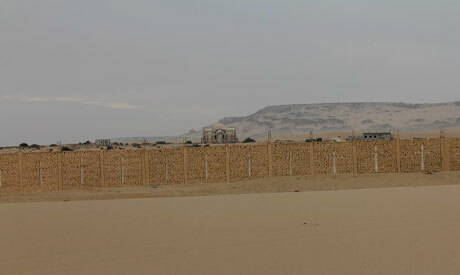 Monks at Saint Macarius Monastery in Fayoum remain engaged in a six-month long dispute with government officials over 13,000 feddans of land. The authorities, who want to build on the land a road deemed crucial for travel in the Western Desert, maintain that the monastery does not own the land. The Orthodox Church of Egypt has tried to mediate a compromise for months. However, the monks insist they have lived on the land for decades and refuse to give it up. 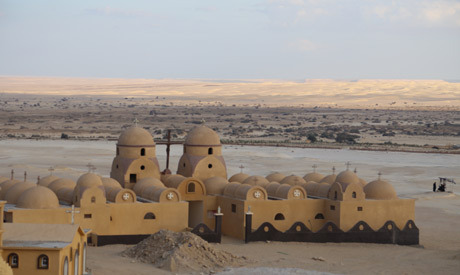 Saint Macarius Monastery is located in the natural protectorate of Wadi El-Rayan in Fayoum, 100 kilometres southwest of Cairo. This area was declared a UNESCO World Heritage Site in 1989. Wadi El-Rayan is protected as a natural environment for animals threatened with extinction, like Egypt's white deer, the sand fox, wolves, and rare migrating birds in addition to wild plants. Monastic life in this locale goes back to the 4th century when Saint Macarius, the Alexandrian, lived there. 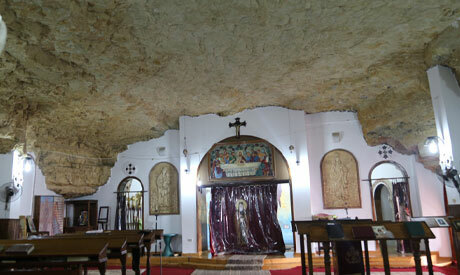 Monks remained in Fayoum until the 15th century when they left the area for around five centuries. In 1960, Father Matta El-Meskeen, or “Matthew the Poor”, went to the Wadi El-Rayan desert and lived as a recluse for nine years before seven other monks joined him. He later returned to his monastery, but his disciples remained in Fayoum. El-Meskeen had disagreements with the late Pope Shenouda III over theological and dogmatic questions, including on the concept of theosis and the incarnation of Christ. 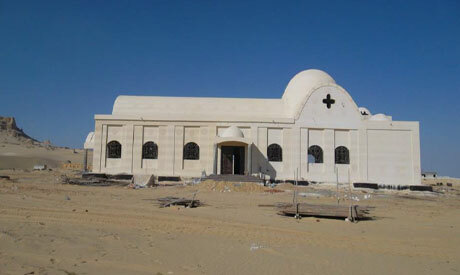 “This unique area has been occupied by the monastery since the January 2011 revolution," the head of the protectorate and an official from Egypt's Roads Authority told Ahram Online. "Before 2007, the monastery was following our instructions and there was no problem. But they built an eight kilometre wall to surround the monastery, despite a ban on such actions under the Law of Natural Protectorates," he continued. He added: "Even after all this, we were very cooperative and made agreements with the monastery's monks. The last one was reached in April 2013, consisting of 12 clauses, including opening six gaps in the wall to allow tour groups to enter the monastery. But unfortunately they breached this agreement and continued with their illegal construction." The state wants to construct a new road linking Upper Egypt and the Western Desert oases, passing through land claimed by the monks. Construction of the new road was supposed to start in October 2014 and the first phase was expected to end within one year. The new road is part of a national mega-project announced by Egyptian President Abdel-Fattah El-Sisi on 22 July 2014, which includes 39 new roads with a total length of 4,400 kilometres. The first phase of the project begins with 13 roads at 1,200 kilometres, including the 80 kilometre Fayoum-Al-Wahat road, passing through the monastery’s claimed lands. On at least two occasions, the monks have stopped construction workers from starting the road building process. 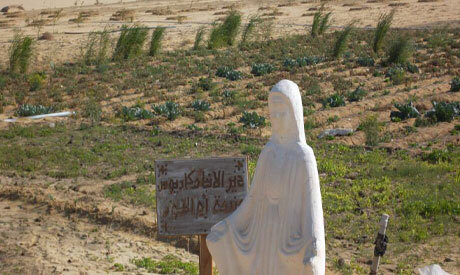 It took just a few hours from Cairo to reach Saint Macarius Monastery in Wadi El-Rayan protectorate. As soon as we entered the monastery gate we found a road that was being paved by the monks, absent of permission from Egyptian authorities. On the right side on the monastery, there is Al-Manqueer Mountain (Jabal Al-Manqueer) in which the ancient church, monks’ retreats, workshops and ancient caves are located. On the opposite side, a new church appears to be under construction, next to four springs the monks control. The state's decision to build a road through the areas controlled by the monastery triggered anger among the monks, who say it would split the monastery into two halves. Meanwhile, the monks — rejecting the plans of the authorities — rotate between secluding themselves in the monastery in protest before resurfacing to rebuild the surrounding fence each time road construction workers demolish it. "(We) will not leave the monastery and will start a sit-in inside it,” insists Athanasios El-Rayani, one of the monks. Athanasios argued that the monastery was declared a historic site "so, [we] will not let anyone demolish it." However, this may not be the only reason the monks reject construction of the road. The government plan, as the monks explained, would also deprive the monastery of the springs monks use to drink and grow their plants. Following negotiations between the monastery, the Church and the government, the state's initial plan for road construction was changed to leave at least one spring inside the lands controlled by the monastery. The springs have indeed been one of the main sticking points in the growing dispute between the monks and the state in recent years. "What the monks did was destroy the environment, and this led to the loss of rare animals in the area," the head of the protectorate claimed. "As you can see," he admitted, "the new road that the state wants to construct will divide the historic church and monk’s cells from their agricultural activities at the springs." "Yes, it will harm the planted area, but it will not lead to any demolition of historic sites as the monks claim," he added. Based on the revised plan, the Church then approved of the construction process, saying it "encourages development projects planned by the state for the public good while preserving churches, archaeological caves and monks' cells." 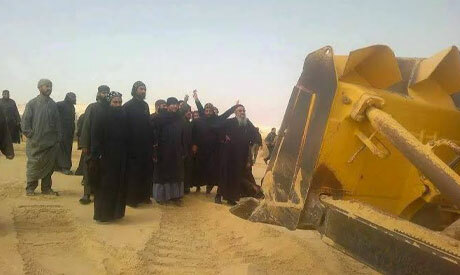 "We believe this road is an extremely important project to make oases in the Western Desert reachable," Bishop Abraam of Fayoum told Ahram Online, adding that the area needs development, and without a network of roads this will remain difficult. The Coptic pope tried to cool the situation by forming a committee of bishops, including Abraam, to look into the matter. The committee was assigned to negotiate with the monks and convince them to vacate the land set aside for the new road. The committee recommended the monks keep 3,000 feddans of the disputed land, returning the rest to the state. However, the 136 monks could not reach a united response to the church's proposals. The church retaliated to opposition by some of the monks to its conflict-resolution proposals by recently depriving eight dissident monks of their clerical status, including Father Elisha El-Maqari, one of the founding fathers of the monastery in the 1960s. Last October, the Pope appointed a three-bishop committee to oversee the monastery. On Thursday, the church appointed a new spiritual director for the monastery, to set the monastery back in order. A majority group of 116 monks declared their support for the Church's recommendations and punitive measures against the disssidents. "We confirm full obedience to our beloved Pope Tawadros II, our Coptic Orthodox Church … and its decisions," a majority of the monks declared in a recent statement. The Coptic Orthodox Church represents Christians around 90 percent of Egypt’s Christians, who make up between 10-15 percent of the Egypt’s 90-million strong population. Indeed, it seems that the state's intransigence and support from the Coptic Church for its road plans, have knocked the wind out of monks' opposition. For the last two weeks, no attempts to disrupt the road construction plans have been reported, however the monks who were deprived of their clerical statuses are still trying to build public support to their cause as the dispute continues.